The location plate is an important part of a BeamClamp assembly. It provides support for the rear of the BeamClamp to react against while the front of the product clamps down on to the steel. 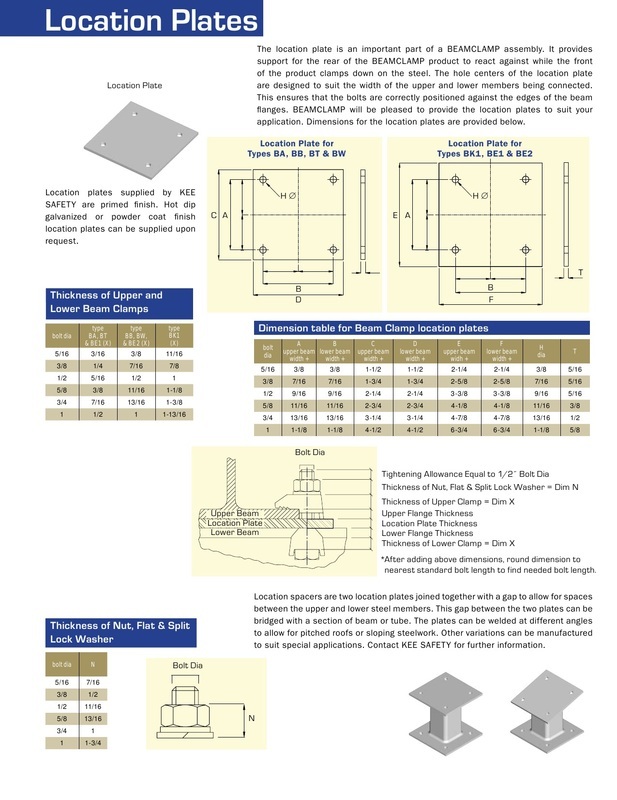 The hole centers are designed to suit the widths of both the upper and lower members and to ensure that the clamps are located as close to the edge of the steel as possible. 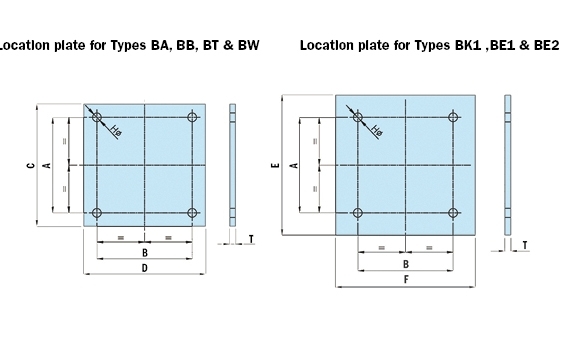 Location plates can be fabricated to suit a variety of applications with different angles of cross over and gaps between sections. We will be happy to assist, free of charge, with detailing these plates for your individual applications. 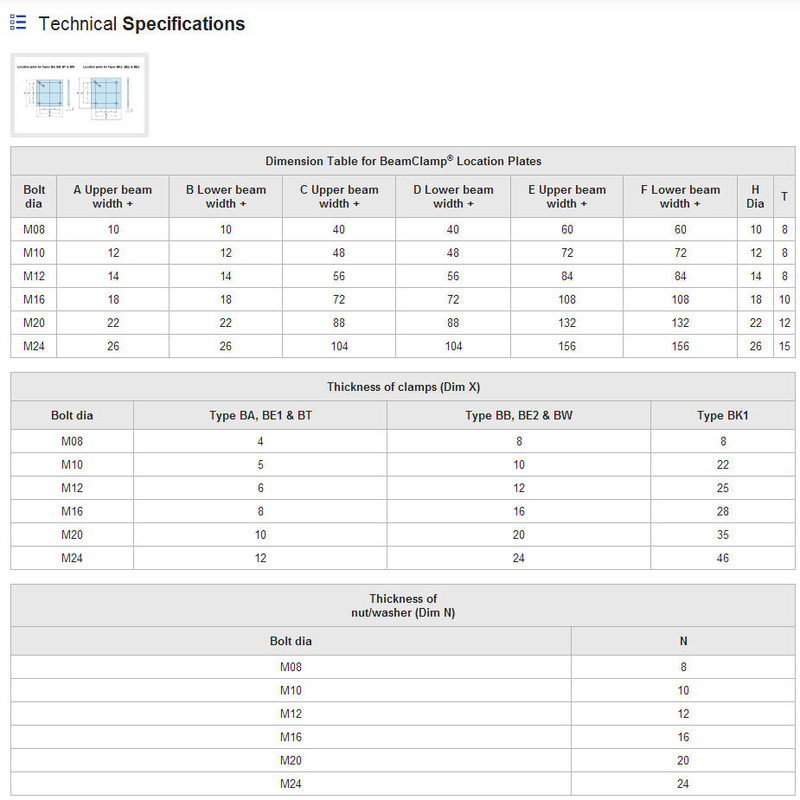 Why do I need a location plate? 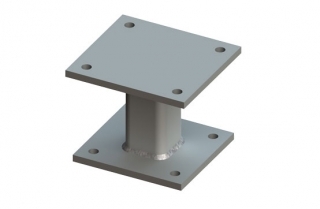 Answer: The location plate is manufactured to suit the size of steel it is connecting together and therefore ensures that the clamps are securely up against the steel flange and are clamping onto the steel. It also stops the clamps from being able to fall off backwards. Can I drill my new steel and remove the need for a location plate? Answer: Yes. 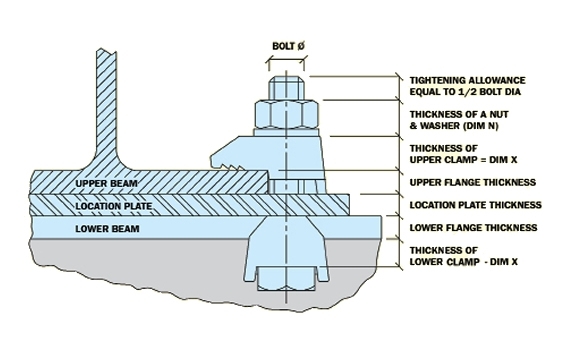 If the option to drill the new steel that is being secured to the existing steel is possible then the need for a location plate can be removed. This will mean though that adjustability for the connection will only be possible in one direction. With a location plate the connection is totally flexible in both axis for adjustment which can be very useful on site. What finishes do the location plate come in? Answer: Our standard plates are supplied with a primer finish as generally they are used internally and this is enough to stop them corroding. We can however provide them in any finish for other applications this just needs to be stated at the point of order. Answer: No. The location plate will be supplied in a kit form with all the clamps, packing pieces, nuts and washers that you would need to make each connection. An Engineering drawing will also be supplied with each kit to make installation easy and safe.